NOTE – Topaz Labs has completely reworked Remask. Please read my newer article here. 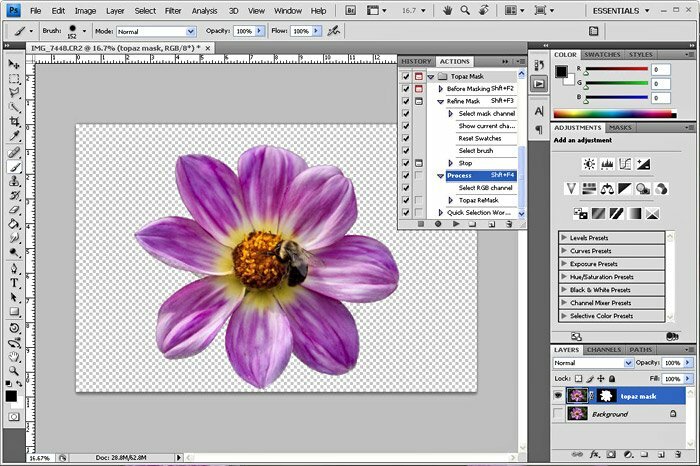 When is a Photoshop plugin not a plugin? When it really controlled by a set of Actions. I love OnOne’s Mask Pro for masking. It provides great control and becomes intuative after a while. Topaz ReMask is something very different. Basically, you create a quick Mask using Photoshop’s tools and then activate Topaz ReMask through a set of Photoshop Actions to perfect the mask without leaving Photoshop. Second, you will need to install these Actions manually from the “Load Action” drop-down menu in the Actions Palette. With the image open in Photoshop, go to the Actions palette and find the Topaz Mask folder. The first Action will say Before Masking. Highlight this action and click the Play arrow. Topaz will then duplicate the image on a new layer, add a layer mask and start you in masking mode. Select the Brush Tool with a size appropriate for the subject matter and change the brush paint to a medium gray (R102/G102/B102). Now, just draw on the edge of the object covering both the part to keep and the part to mask. This will create the primary area for ReMask to process. With the gray border in place, fill the area to remove with pure black. The remaining white area will be protected. Now, run the Action called Refine Mask. With all the prep completed in Step #3, it is now time to generate the mask. However, the final Action needs to be applied directly to the Image and you will still have the Layer Mask active. In the Layers palette, you need to click on the image itself. You will see the red mask disappear. Now, in the Actions palette, run the Action called Process. That’s it. Since ReMask does not alter the Image Layer itself, you can now make additional changes to the Mask Layer. So what do I think about ReMask? 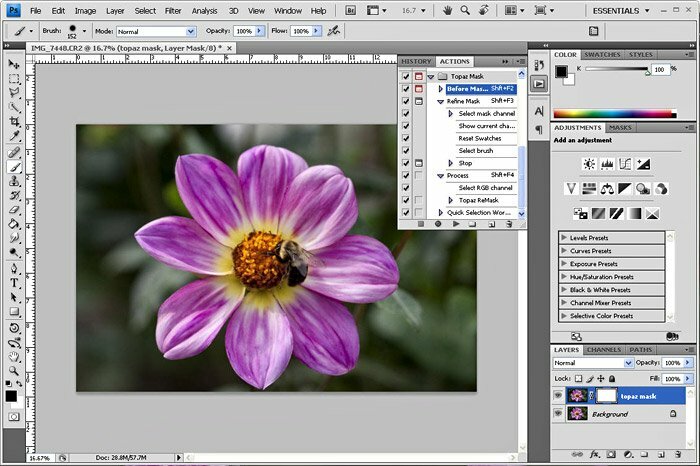 For quick masking, you may find this program very helpful. It also is only $70 for both a 32-bit & 64-bit versions. Topaz offers a trial version of ReMask on their site and several videos explaining the process. If you like Topaz products, you should register for their email newsletter. They always offer discounts! I will continue to use ReMask for quick masking. But, for complex masking, I still like the precision of OnOne’s Mask Pro tools and color selection controls. Can you tell me, or send to me this Topaz ReMask Action.